Industrial sewing machines are designed for heavy-duty sewing tasks which regular sewing machines cannot handle. Capable of handling a wide variety of material, ranging from apparel to upholstery and everything in between, these machines get the job done quickly with high accuracy. Whether you’re someone who runs a large-scale manufacturing unit or sew professionally, there’s a sewing machine for every need and budget preference. These machines can sustain non-stop, repetitive stitching for hours in order to keep up the high productivity, which means you will never have to stress about the deadlines. No two businesses are alike and that explains why all industrial sewing machines are not created equal. Therefore, it is important to pick the right one as per your needs and the kind of sewing business you are engaged in. This is one of the deciding factors that help in choosing the right sewing machine for your business. Industrial sewing machines are much faster than the ones that are used in domestic environs, offering a fantastic speed of 1000 stitches per minute, which can go up to the tremendous figure of 5000 stitches per minute. Based on the speed you need for your stitching operations, you can pick the suitable machine. However, there’s an inevitable trade-off between speed and material handling. The machines that operate faster may not be able to handle thick materials, such as leather and canvas, and vice versa. Industrial sewing machines operate at different voltage levels, depending on the area they are being sold in, as well as the intended purpose. 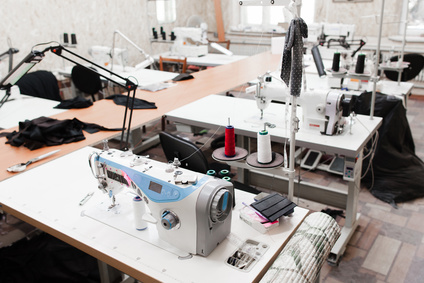 You will want to figure out whether your premises are supplied with 440, 220 or 110 lines, only then will you be able to choose a suitable sewing machine, lest you’ll have to make changes to the wiring system from ground up to ensure you are using the right power supply. There are mainly two types of motors that drive industrial sewing machines. That being said, you can choose between Servo Motor and Clutch Motor, based on your requirements. Servo motors are quieter, flexible with stitch speed and are specifically designed to handle light and medium-duty fabric. These machines are compatible with almost all kinds of industrial sewing machine thread, which are used to create decorative stitches. On the other hand, the Clutch Motors produce immense power to stitch thick fabric, such as leather and canvas. Flat bed: This is the general bed-type that can be used for any material, when there’s no specific requirement. Post Bed: This type is specially designed to ensure accuracy in decorative stitches, wherein details matter more than anything else. Cylinder bed: This type of bed is suitable for intricate stitching around areas that are hard to reach, like those in footwear, purses, seat covers, etc. This is another factor you ought to be mindful of when purchasing a sewing machine. You must know the dimensions to ensure the machine can be maneuvered around and installed without any difficulty. Finding the right sewing machine wouldn’t be difficult if you knew what you want. This suggests looking into your requirements and calculating the budget you can devote to the purchase. The above tips will definitely help you pick the industrial machine that will simplify your stitching operations and boost productivity.